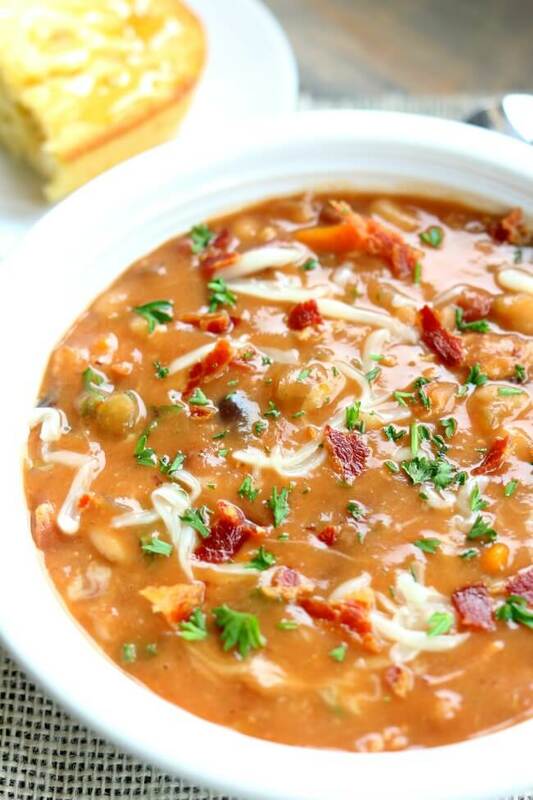 Instant Pot Bean and Bacon Soup–dried beans are cooked quickly in your electric pressure cooker along with carrots, celery, garlic and bacon. A simple but seriously delicious soup that will leave you wanting seconds (and the leftovers the next day are even better than the first day). Big thanks to Hurst’s Beans for sponsoring this post. 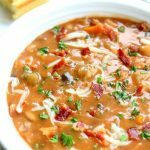 I love this Instant Pot Bean and Bacon soup! I made it yesterday for dinner and just got out the leftovers for lunch today and it tasted even better the second day. 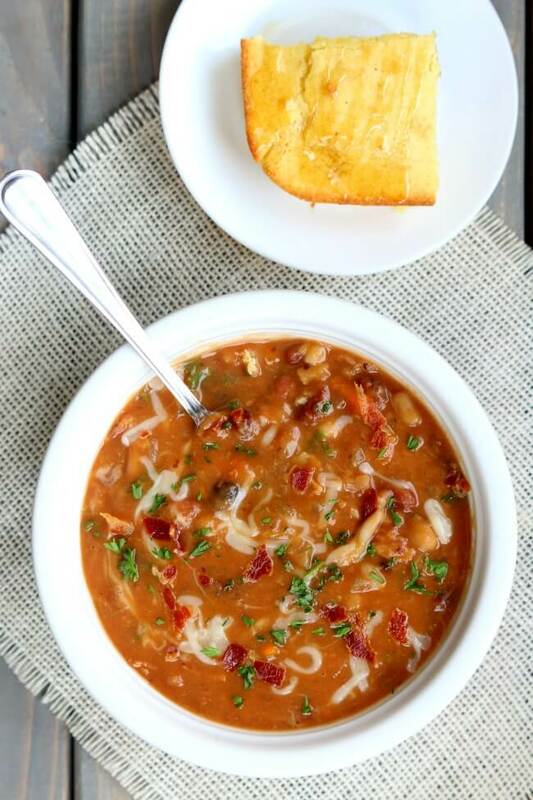 It’s got almost a creamy consistency for the broth and there’s just so much flavor in it thanks to the bacon and the seasoning packet that’s included with the Hurst’s 15 Bean Soup package. My kids loved it too and we all had multiple bowls. I prefer soaking my dried beans before I cook them. I just find that the consistency turns out much better this way. Most of the time I don’t remember to soak the beans the night before so I’ll teach you a method of how to quick soak the beans in your Instant Pot. First just pour the beans into a colander and rinse them off. Sometimes dried beans have a little dirt and debris in them. Once they have been rinsed you can add the beans to the Instant Pot. Next you’ll cover the beans with water. For every one cup of beans you’ll want about 3-4 cups of water. I used 10 cups of water for the entire package of dried beans. Now you’ll add in salt. The salty solution is essential to getting the beans the right consistency. I added in one tablespoon of salt. Don’t worry, we’ll rinse the beans of the salt before we cook them in the soup. 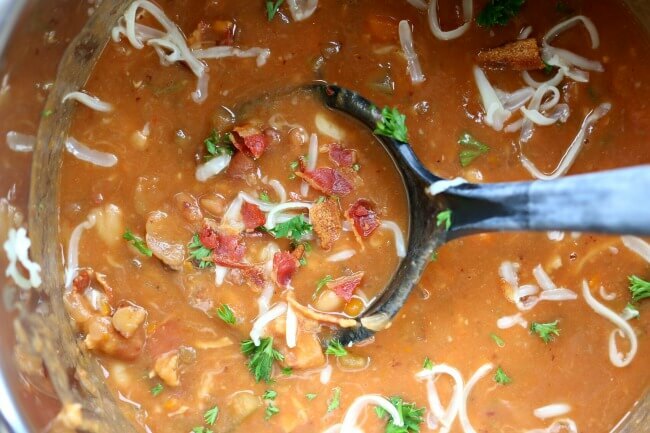 For this Instant Pot Bean and Bacon Soup I used my 6 quart Instant Pot Duo 60 7 in 1 for this recipe. I also own the 6 quart Instant Pot IP-LUX60 V3 Programmable Electric Pressure Cooker. They are both great pressure cookers! The first one I mentioned has a yogurt making function but other than that they are fairly similar. The price difference between the two is about $20. 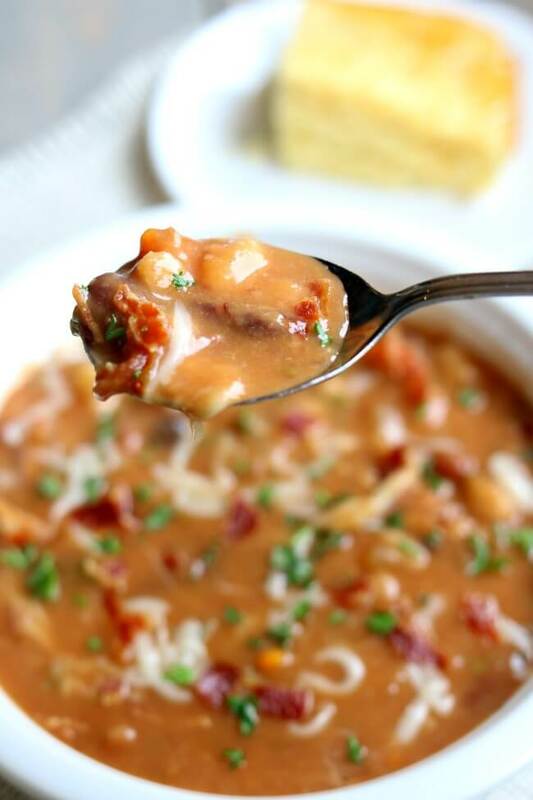 Dried beans are cooked quickly in your electric pressure cooker along with carrots, celery, garlic and bacon. A simple but seriously delicious soup that will leave you wanting seconds (and the leftovers the next day are even better than the first day). Open the package of beans and reserve the seasoning packet for later. Soak the beans with the water and salt overnight in a large bowl (8-10 hours) or do the quick soak method (outlined below). Add pre-soaked beans to the Instant Pot. Add in onion, carrots, celery, garlic and broth. Cover and secure the lid. Make sure the valve is set to “sealing.” Set the manual pressure cooker button to 3o minutes. Once the timer beeps you can let the pressure release naturally for 10 minutes and then release any leftover pressure, or if you prefer you can just do a total natural pressure. Remove the lid and stir in the tomato paste and reserved seasoning packet. Pour about 3 cups of the soup into a blender. Cover with lid (while removing lid’s center insert and holding a folded kitchen towel over the opening) and blend until smooth. Stir pureed mixture back into soup. Right before serving stir in the bacon. Salt and pepper to taste. Garnish with parsley and mozzarella cheese, if desired. I’m not sure my store has that brand of beans – so could you tell me if it list the spice ingredients for the seasoning packet and if it’s gluten free? The recipe sounds delicious! And it does say it’s gluten free! I made this recipe for the first time yesterday. It is delicious and I will definitely be making it often! I quick soaked the beans in my Instant Pot and they were completely cooked during that process. I reduced the 30 minute cook time down to 5 minutes just to soften the vegetables. I don’t think my beans would have survived a full 30 minutes. I made this recipe again and again it was delicious! Your soaking directions worked perfectly this time. I’m pretty sure my first beans may have boiled a few minutes before I noticed. That would explain why they cooked so fast. 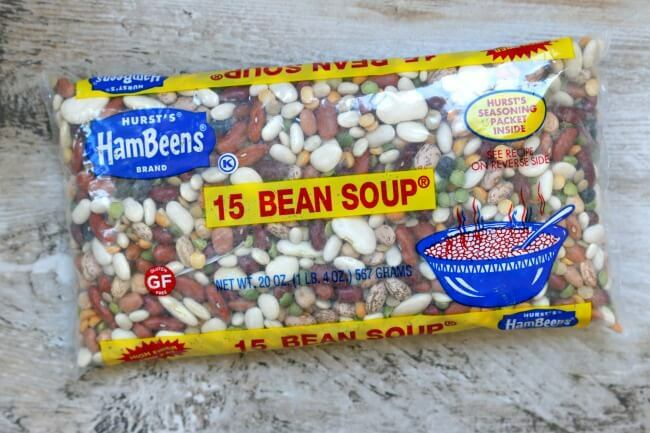 I love soup, but that’s a lot of servings. Does the soup freeze well? It does make a ton! I think it would freeze just fine. I haven’t tried it yet myself.